As Moloka’i is a small island off Maui, one that not many tourists visit, there are no restaurants really designed for tourism. The downtown core, or mile zero, really reminds me of my home town as it’s one block and everything you need is there. So it’s easy to discover where to eat in Molokai because there are not a lot of options. But what is here is very good. This is a local’s favourite and is busy at night. I was told it tastes like Pizza Hut but better and I think that is a fair assessment. I got pizza to go (which I ate while driving in the photo above) for a day at the beach. 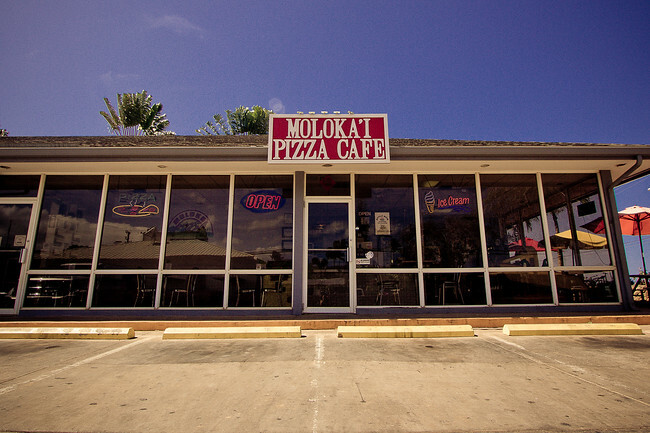 Moloka’i Pizza Cafe also sells burgers and other mains. I heard from vegetarian travelers that the veggie burger is great and likely made from scratch. Definitely my biggest surprise on the island, Outpost Natural Foods is a tiny shop with health food and organic produce. In the back there is a juice bar and a little vegetarian cafe. It seems that Hawaii is very meat oriented so I was so happy to have a meal without it. This is a new restaurant that everyone is raving about. The cashiers at Molokai Burger is really friendly and suggested I try the paniolo (Hawaiian cowboy) burger and get extra sauce for the fries. Yes that is an onion ring on top of the burger and it was probably one of the best hamburgers I have had in years. I ate at Hula Shores the most because it was the restaurant at Hotel Molokai. But a lot of locals come here as well as it’s only one of two bars on the island. The menu changes depending on what the fisherman bring here. What I loved about this place was that I could make substitutions as long as they were reasonable. I was really craving green vegetables so they put broccoli on my salad or substitute broccoli for a side salad. It’s strange how you really start to crave vegetables but I was so thankful for it. Unfortunately a few years ago there was a devastating fire at Hotel Molokai. Hula Shores was replaced by Hiro’s Ohana Grill and has the same great reviews. Disclosure: I was a guest of the Moloka’i Visitors Bureau during my time here although all meals were on my own. No one asked me write positive reviews for where to eat in Molokai or insist that I make strange broccoli substitutions. This photo gallery is full of really tasty looking shots. I love that you seemed to frequent small funky establishments. I’d be all over that Molokai burger myself. I like fresh fish, so that Hula Shores sounds great! I like going to a restaurant, and then basically ordering whatever is fresh today from the sea that day. You can’t be too picky about your food at that point thou. Wow I really have a craving for the Hawaiian cowboy burger now! I can eat it for breakfast, right? Mmmmm. It’s interesting that Hawaii is such a meat-centric culture. Without limited real estate and not much room for grazing, I would imagine most of the meat is imported, and therefore, pretty expensive. You would think that this would increase interest in cheaper, locally produced alternatives but I guess not. Still haven’t gone to molokai or lanai! That burger looks ridiculously good. 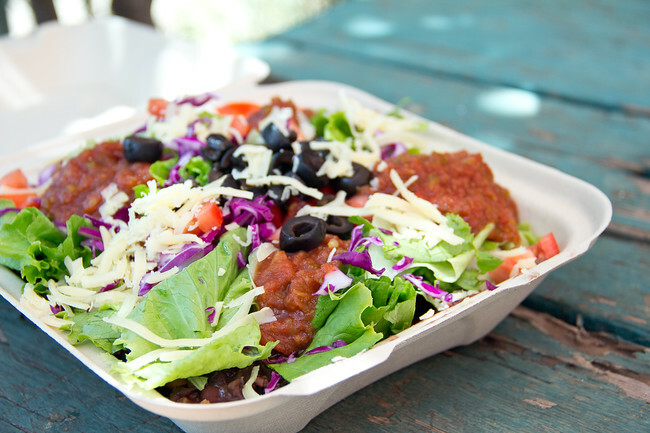 There’s nothing about substituting broccoli with something more tasty! That last foto looks really tasty!!! Great tips. I love the photos. You really know how to take photos of food. It looks so delicious. 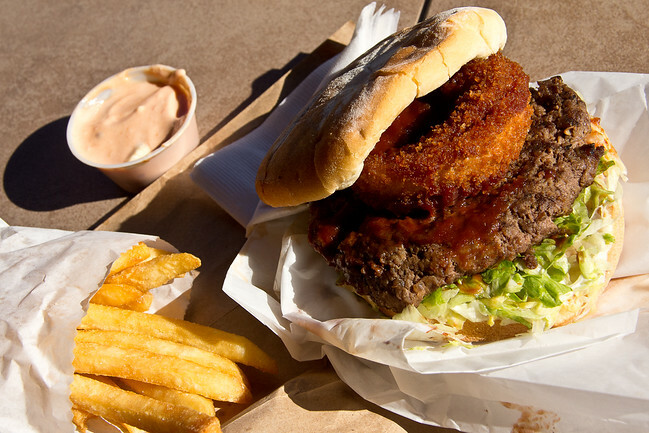 I’ve been craving onion rings like whoa so that Hawaiian Cowboy burger is singing a siren song to me. Droooooooool. That looks like a burger worth raving about! At first I thought it was a fried chicken patty on top… but a thick onion ring is even better! I agree with you, while I do enjoy meat, it’s nice to balance things out with lots of vegetables too. You always find a way to get your veggies haha. All this food looks awesome! Veggies keep me looking young, I never want to look my age! 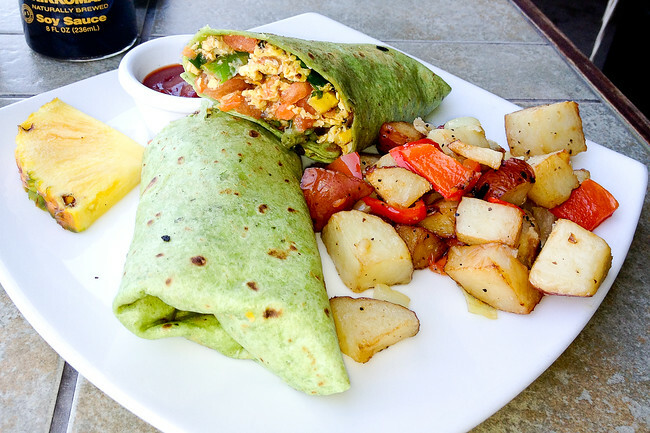 As a veggie I found so many awesome veggie spots on the islands! People here have been really great with my special requests, I don’t think it would be difficult as a vegetarian.